My daughter Jamie from Hawaii visited with us some years back. We queried her for some Spam recipes and she did provide. I also was shown what ancillary sauces and spices to use with Spam. So this thread will be for this purpose. Note: These items can be picked up a your markets Asian section or at a Asian Market. Wash rice; add the 7 1/2 cups (using 3/4 cups as 1 measure) water. Cook rice; let stand for 15 minutes. Cut each block of SPAM into 10 slices. Fry SPAM slices to desired brownness. Place cooked rice in a large bowl. Combine the 2/3 cup water, salt, mirin, and soy sauce. Sprinkle 1/2 of mixture over rice; mix well. Use remaining mixture for moistening the nori and knife. Place a sheet of nori onto a flat work surface, place musubi mold in the center of the nori. Fill musubi mold 1/3 full of rice; press rice down with inner section of mold. Spread ume on rice; place two slices of SPAM over ume. Add more rice to fill musubi mold; press down again. Remove musubi mold and wrap nori around the musubi, sealing edge with a small amount of the mirin mixture. To serve, cut musubi in half (for parties, cut into fourths). Garnish with furikake and benishoga. 2 Cut SPAM® Classic into 4 slices. 3 Grill SPAM® Classic, pineapple and bell pepper, turning once, 5 to 7 minutes or until heated thoroughly. 4 In bowl, stir together mustard blend and garlic; spread on cut sides of buns. Fill each bun with lettuce, SPAM® Classic, pineapple, bell pepper and cheese. Cut SPAM into strips or diced. Slice half a round onion and one medium cabbage thinly. Chop one clove of garlic. Heat sesame oil in pot. Add SPAM & all other ingredients. Cook until cabbage is done. Sounds tasty these new dishes with spam as the primary ingredient. I like spam, though it is very rich and when fried is much the more richer. 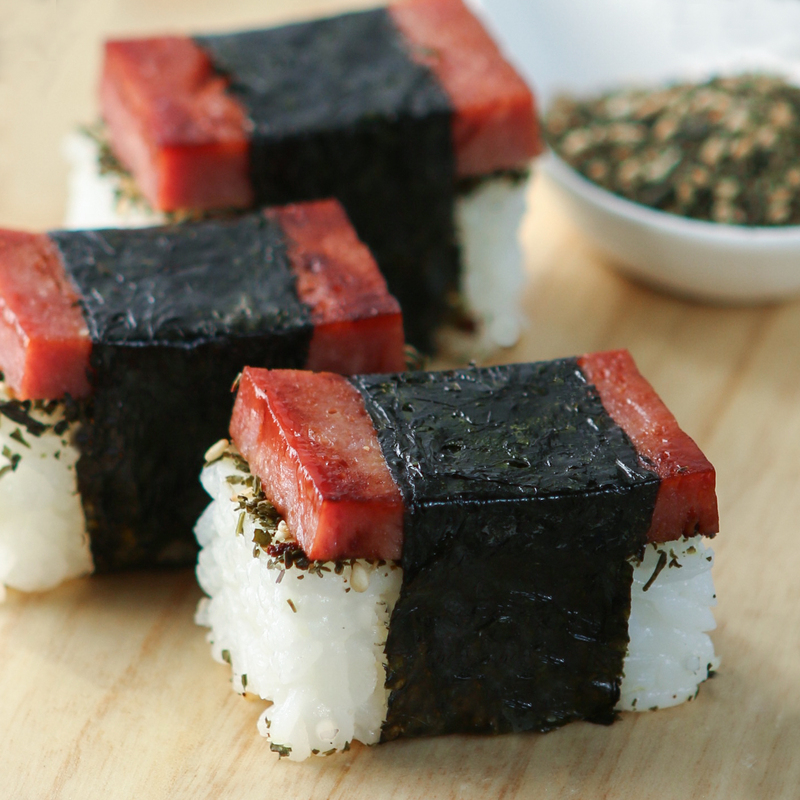 The rice cake beneath the slice of spam then covered with a leaf of seaweed for flavor sounds even more tasty. It is a good idea to wash rice to remove the sticky from it, although this looks as time consuming and complicated, should not be so. That is if the ingredients are first placed out for access before hand. It has been many years since, but we used to gather seaweed as a flavouring for various meals such as soups. With sea weed though, it should be gathered from an area that has fresh sea water flow and not near a harbor where the problem could be from bilge water discharge which is both oil residue and waste products pumped out. Looks pretty good to me Pieter. This morning we had our own free range chicken eggs with Polish bacon and English muffins. these pictures make me hungry. 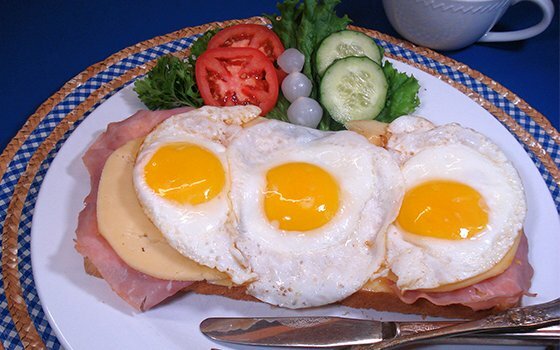 It looks delicious and we will have to try the eggs for breakfast also. SPAM sushi and cabbage are also very interesting. This Hawaiian Spamburger looks delicious and these SPAM Musubi and Hawaiian Spam and Cabbage look delicious and good too. Nice recepies. Thank you John!. I have to admit that as a Dutchman I love a good Big Mac or Quarterounder of Mc Donald's or a Whopper burger of Burger King, but what I know since I visited the West of the USA ( California, Arizona, Nevada and Utah) and the Eastcoast (New York) that in real authentic Hamburger restaurants and just classic American restaurants and cafeteria the quality of the Hamburgers or steaks are even better. I loved the refined, delicious meat I ate in Utah for instance. Pink-beige coloured beef. I saw the cows and bulls in the Utah Prairie with real Cowboys, so the meat of these Utah (and Californian, Arizona and Nevada) cows is very good. It was like in South-Africa where they have delicious steaks too. I ate Kudu, Springbok (deer), Zebra, Ostrich, Crocodile and South-African beefsteak there. 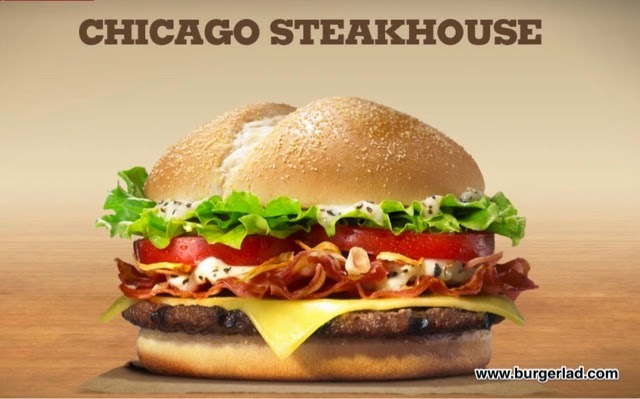 In Arnhem you can order and eat now Chicago burgers next to the Hamburgers, cheese burgers, Big Macs, Quarter Pounders and whoppers of McDonalds, Burger King and the Dutch cafeteria ( snack bars or French fries stores like the Dutch call them). What I like to order in such a French fries store is a Kapsalon, which is French fries, with kebab or shoarma meat, cheese, vegetables and garlic says. Kapsalon is a Dutch food item consisting of fries, topped with döner or shawarma meat, grilled with a layer of Gouda cheese until melted and then subsequently covered with a layer of dressed salad greens. The dish is often served with garlic sauce and sambal, an Indonesia-derived hot sauce. Kapsalon is high in calories, with each serving containing approximately 1800 kcal. The term kapsalon means "hairdressing salon" in Dutch, alluding to one of the inventors of the dish. Nathaniël Gomes (right) with the owner of the shawarma store "El Aviva"
The dish was conceived in 2003 by Nathaniël Gomes, a Cape Verdian hairdresser in Rotterdam who in collaboration with the neighboring shawarma store "El Aviva" combined all his favorite ingredients into one dish. The dish has since spread around the Netherlands into Belgium. My cooking at the flat would be most likely deplorable to normal people, and I would agree. Usually it is quick, absolutely not formal. I come home tired, in not a very good disposition, if laundry is short, start up the laundry whilst checking what I already now is in the cooler, drink a glass of milk as a calmer, check if the wine shelf has much to offer and settle on another glass of milk. Usually as a stand by, it is a make up of ingredients that are available in the crisper such as potatoes/cabage/union/carrots and two or three eggs from the market. Cut up as time and desire requires/place in which ever pot is clean, lace very well, such spices as Italian seasoning/Cajun seasoning/black pepper and most any type of hot pepper that is on the shelf/ two to three packs of top Ramon or package noodles that is available here. Cook in medium heat until cut carrot taste cooked for they usually cook more slow then the potatoes. The, crack two or three eggs stir rapidly to break then up and distribute evenly through. Place on slow heat for about five minutes, then done.. It then is very moist and with a quick fry up of two eggs or a nice sandwich to go with it. The bread here is surprisingly very good and usually fresh. They use a great deal of corn and rough ground wheat in their cooking so crack wheat or a type of heavy wheat bread with ground nuts is very good and very healthy. If to become disparate, to then visit one of the canteens at VW not far as they are open on a 24hr/7day week and eat there. They have a very excellent variety with both Mexican/American style which is very much alike to European. They also have two of my most favourite deserts, peach cobbler and apple cobber or crisp. One or the other is then drenched with sweet cream and eaten with delight. I need to come and visit you for about a month. I will bring some kitchen tools and my own cookbook. In this time I can guaranty that your appearance will enhance with a little expansion. Let me know if it is a good idea. Bachelors or single living men often eat simple meals, and do not excel in great dinners or recepies. We cook pragmatic and easy. If we cook for friends, family or large groups we put more effort in our cooking.My cooking is slightly different than Karl's, but like Karl I come home tired, sometimes exhausted from the hectic day with television. Than I love to go to the supermarket for shopping. A typical simple Dutch meal is vegetables, patatoes and a piece of meat. In the winter I love the Dutch Mash pot dishes, Boerenkool met worst (Grünkohlessen in German, Kale with sausage in English), Hutspot served with a pork chop. But I also like Indonesian and Chinese food, and to make Italian style Spagetti Bolognese, which his Italian pasta, with ground beef, fresh tomatoes, chopped garlic pieces, a lot of herbs, black pepper, salt, and chopped Leek, Paprika's, onions, and some other vegetables. You mix these ingredients with taste. How well do I agree with Pieter, perhaps though I have painted an overly bleak picture of my cooking. Yes, as Pieter has mentioned, we single living people do cook simple. His cooking is much the better then mine this for sure. Some times dependant upon my time, I will simply stay over and eat at the canteen. There are some very good markets here with wurst that is simply out standing and very good heavy wheat bread. These make a nice meal of boiled cabbage and wurst with some sliced tomatoes or sliced cucumber with vinegar is nice. The wurst goes well also with fried cabbage and some peas or corn. Usually will have some frozen dinners in the cooler and a salid is good for those off days. The market has of late carried boxed wine which is supprizingly good. A couple of glasses of that, some taped music and then who cares. I think I am becoming hungry again!